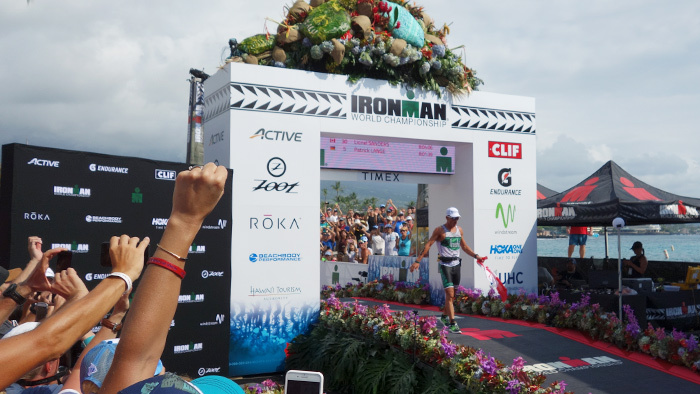 The 2017 IRONMAN® World Championship in Kailua-Kona, Hawaii was an exciting one, especially on the men’s side with several position changes and a last-minute pass by Germany’s Patrick Lange to become the 2017 world champion. Below we take a look at the bike file of 2nd place, über-biker Lionel Sanders, to see how the day shook out. 2017 was Sanders’ third attempt at the IRONMAN® World Championship, finishing 14th in 2015 and 29th in 2016. Despite some windy weather and choppy conditions in the days leading up to the race, race-day weather proved to be ideal for breaking course records and resulted in Sanders’ best finish yet, as he hung on to secure the second spot on the podium. Lionel exited the swim over six minutes back from Kona rookie, Australian Josh Amberger, who hammered the pace on the swim and went on to lead the bike until the climb to Hawi. Our initial Best Bike Split predictions had Lionel riding a 4:20:15 at a whopping 4.25W/kg, but between milder weather conditions than anticipated and pushing the pace, Sanders rode six minutes faster, effectively breaking the bike course record. Despite his blazing speed, averaging over 26mph (42kph ) over 4 hours and 13 minutes, Sanders was not the fastest bike on the day, which belonged to Cameron Wurf, the new bike course record holder with a bike split of 4:12:54. 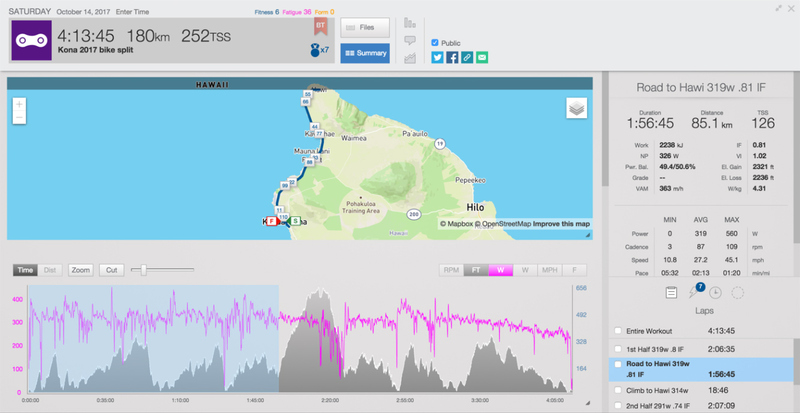 Sanders started the bike with perennial favorite, and fellow strong cyclist, Sebastian Kienle, averaging 319 watts for almost two hours at an Intensity Factor of .81 on the way out to Hawi (slightly higher than the .8 we typically see for the male pro winning bike file). 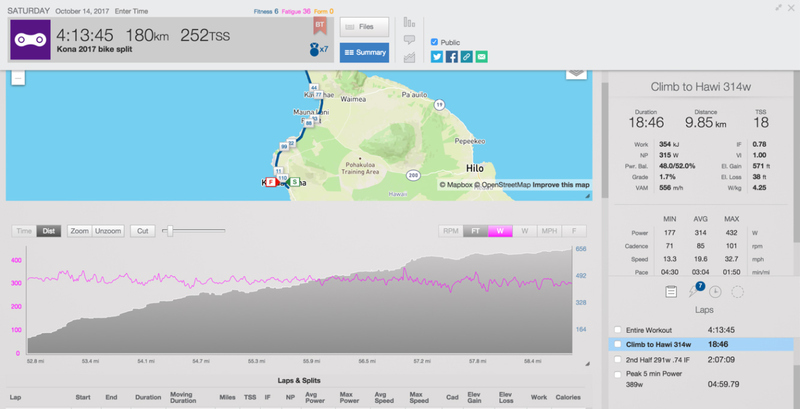 Sanders passed Amberger to take the lead on the grinding six mile (9.85km) climb to Hawi and settled into a slightly more comfortable pace at 314 watts with Sebastian Kienle, Tim O’Donnell, and Cameron Wurf in tow. 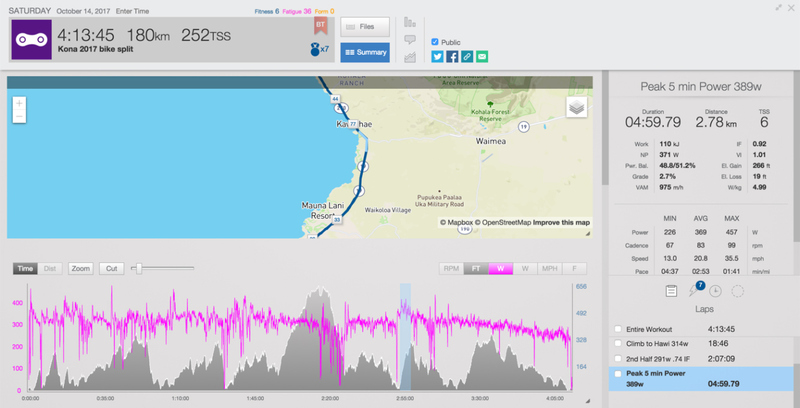 Wurf made his move at around 76 miles to take the lead on the punchy 1.7 mile (2.78km) climb to Kawaihae, which is also where Sanders put out his best five minute power at 389 watts, perhaps an answer to Wurf’s attack. Wurf would hang onto the the bike lead to exit T2 in first place as Kienle and Sanders continued to fight for second. After the kick-up to Kihole, Sanders’ power started to fade ever so slightly. Perhaps preparing for the run or maybe the hard effort was starting to tell. 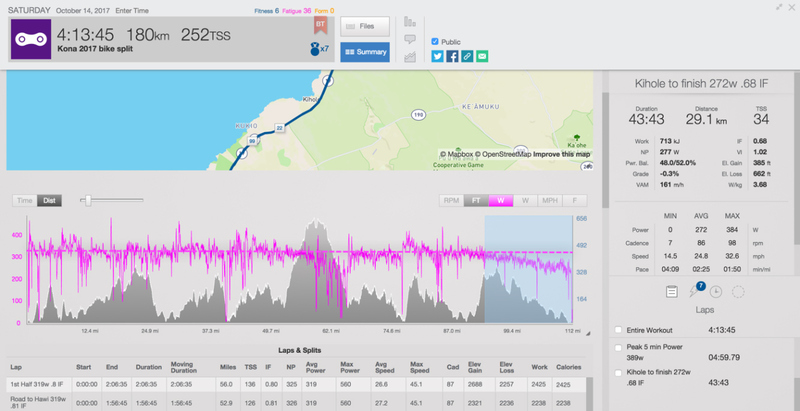 While he had averaged 312 watts and an IF of .79 for the first 94 miles (151km), he only averaged 272 watts and an IF of .68 for the final 20 miles (30km) into the finish, a difference of about 13 percent. Sanders came off the bike about a minute behind Wurf and quickly took over the lead on the run. He would lead most of the run averaging 6:34 minutes per mile with his unique running style until he was finally bested with three miles to go by Patrick Lange, who made it look effortless in stark contrast to the pain Sander’s was trying to hide. Lange would go on to break the course record finishing in 8:01:40, with Sanders not far behind in second place at 8:04:07. Congratulations to Lionel Sanders on his hard-fought world championship podium finish. Check out his bike file here.